The Small Whale Scratchers are contoured especially for your cat. The whale flowing tails provides a wonderful sleeping area, while its belly offers the perfect hiding spot for toys and treats. All of The Scratchers include a bag of Certified Organic Catnip. You cannot fight the natural instinct a cat has to keep his claws honed, so give him a healthy alternative. 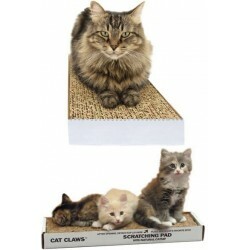 The texture of the Scratching Pad is unlike any other texture in your home. It is not carpeted, like your floors. It is not covered in any kind of nubby material that could be similar to your couch upholstery. Your cat will not be confused as to what he should and should not scratch. Your cat can feel that this unique surface is his very own personal place to scratch. Features: -Made from 100pct post-consumer recycled paper - 100pct recyclable.-Provides your cat with a natural scratching surface to keep their claws honed and healthy. 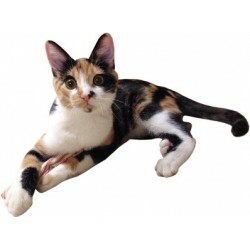 -Unlike any other surface in your home so your cat will not be confused as to what he should and should not scratch. -Includes one bag of certified organic cat nip. 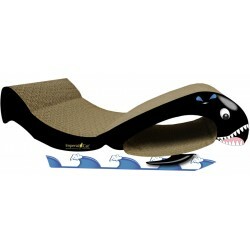 -Beluga whale style. -Dimensions: 5.25'' H x 9'' W x 17.5'' D.